Forest Grove beaver removal can help solve flooding problems, tree and plant damage problems, and property loss problems. 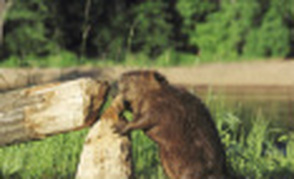 We have over 30 years experience in solving beaver damage problems throughout Oregon. A beaver will never stop chewing or trying to dam up moving water. There teeth never stop growing, so if they do not chew on something they will keep growing until they might hurt or kill the beaver. Forest Grove has rural areas and creeks that run through different areas. When beaver's have babies and they get old enough they will move up or down the water way which means eventually some will end up close to town. When the beaver are left alone they will have more babies which will cause more damage. If you notice beaver damage near your property give us a call and we can talk about the different options to solve the problem. Depending on the location and activity of the area we have different methods to solve these problems. For Forest Grove Beaver Removal Call 503-201-2432 Today!